After about 8 days, it was time to say goodbye to Pete & Barb, and set off. First thing, the weather forecast showed a long line of thunderstorms, along I-80 moving eastward. I immediately dropped the idea of the turnpike & a fast run, because the thought of having to get the rain gear off to pay the tolls and also keep the tickets dry, then zip everything back up and get the bike going….. bugger that! To avoid getting wet, I dropped down to Tiffin, to spend an hour or so with our good friend Kathy. There was a farmers market in the street, so I had to park around the corner, and there was Cathy, sat on a bench, just where I had decided to park. She was looking very well and had a new hairstyle that really suits her. We had a walk around, then went to see her new home which is absolutely brilliant, very close to the river. After that, it was time for me to take off. I rode along 224 to 24 without incident, but as evening drew on, I reasoned, that, it being a very nice road, very rural and with hardly any traffic, could mean that lots of animals could be running all over it after dark. So, I decided to turn north from Forrest, on 47, to I 80, much more traffic, and hopefully no animals. While filling up, in Forrest, it started to rain, so I got the gear on, and set off. Halfway between Forrest, and I-80 at Dwight, is the Classic Inn Motel, which I have used previously, and it is very nice & cheap, or was, back then. I did think about stopping, due to the rain, but it looked brighter, westover, so I decided to carry on. Why is it, that people, faced with a 50 / 50 thing, pick the wrong one, 95 % of the time ? Needless to say, the bright part to the west turned black, and started to thunder. From Forrest Illinois, to Stuart Iowa, It rained constantly, alternating between constant light rain, to heavy rain to complete downpours; 382 miles of it! It was sort of ok, in the warm sector, but once through to the cold front, even with all my, now wet, gear, I was shivering so badly that I was not in complete control of the bike. While filling up in Stuart I noticed a motel across the road with the vacancy sign lit, so I took a room, got the bags in, tried to dry some stuff, then tried to sleep. The rain cover we have for our bag, is great, but both it, and my good rain suit, gave up under the intense pressure. I did get some stuff partly dry; those Saddlemen saddlebags are awesome, not a drop got in them. Strangely enough, several times on the journey westward from Stuart, I got stopped by thunderstorms while filling the bike, so I’d fill up, grab raingear, helmet & gloves, dash inside and grab a bite to eat, slices of pizza, and V8 & hot chocolate, while the worst went by. It was early evening, as I got into Cheyenne, Wyoming, for a fill up. Sure enough, I saw the black cloud, so once I had filled up, and moved the bike, I grabbed my rain gear etc and dashed inside, to once again grab a slice o Pizza, and a couple of drinks. My old Mechanix gloves with the silicone protectors, were just about worn out, and as I was in a Casey’s, for just over an hour, waiting for the system to, at least ,turn into light rain, I had plenty of time to browse the shop, and ended up getting a new pair of gloves, not as flash as the old pair, but with some moulded in protection. The ladies at the gas station recommended a motel called Sands, one of the drive to your door types. It was easy to get to, and I was well impressed. The front doors to the rooms, were at the side, with a covered car port between the 2 rooms; great Idea, no need to worry about baseball sized american hail smashing the poor Guzzi. As I left Cheyenne, I was in a bit of sun, & it felt warmish. That only lasted utill I hit the interstate, at 75 mph, it was bloody cold, so, first farm pull out available, I left the interstate, and stopped at the bottom to put my windproof rain gear on, swopped my new fangled gloves, for the fleece lined pair I had to buy during the Alaska tour. That made things tolerable, and I carried on, I was looking for the HW789, it’s about 20 miles past Rawlins, The town is called Creston, the road goes south into Colorado where it becomes Colorado 13, and continues to Rifle, Colorado, where you join I-70, that goes to I-15 & St George, Utah. It is 182 miles of great scenery, with few fuel stops, in between. You have to carry fuel for at least 140 miles, and top up at every opportunity. Yes I agree, it feels foolish to buy $ 1.75 worth of fuel, but, when its getting on during the day, those last few drops, make the difference, between riding home & walking home. Also, god only knows what might happen to your bike & belongings, as you set off down the road, with your thumb stuck out. Back in the 1800s or so, Basque shepherds came over to the USA looking for work, and they made their distinctive little wagons and tool carriers, so they could be self supporting, all spring & summer, out in the field, watching their flocks; saw several, during my ride, unfortunately, that road, does not have much in the way of pull outs, so I missed a fantastic photo: a Shepherd, with his tool carrier & wagon set-up, his horse walking beside him, and he even had a Great Pyrenees Sheepdog. I had an 18 wheeler behind me, and nowhere to stop, bugger, bugger, bugger. Anyway a few miles on, I did get to zoom in on one of the distinctive wagons & a horse, but no tool carrier. Yes, even on that ride, as I was filling up in Meeker, I had to grab gear & run inside, as yet another system dumped torrential rain all over the area for about 30 mins. Ok not as bad as Cheyenne, but still! After Meeker, I must have missed a fuel stop , because miles & miles of great scenery went by, with no towns or anything, although the speed limit was 75 mph, I was doing about 55, to conserve fuel. Finally a Visitor Center appeared, so I pulled in, and the lady said, well, if you can make it about a mile more, the fuel stop is right there ! Fortune favours the brave, so I set off, and got to the gas station in Thompson Utah, with 180.9 on the trip counter; that fill up, was the most expensive so far, costing $ 13.08 for 3.87 US Gall. Now, I have to say, the interstate I-70 from Rifle to I-15, is a fantastic ride, not many fuel stops so you have to be able to do about 160 miles before expecting a gas station, even if it means carrying a spare can somewhere. The ride is brilliant as it is interstate, with 2 lanes, there are no skinny twisties, but plenty of bends, obviously as I have stated before, with all my gear, I cannot lean much anyway. But you can ride at 80 Mph, which means about 85, without expecting a speeding ticket. What you may miss in heart stopping leans in twisties, you make up for, when big animals run out in front of you. God had obviously decided that he had rained on us enough, so after the fill up at Meeker, no more rain fell, in fact it got so warm ,I stopped somewhere & took the rain gear off. However, as soon as the sun dropped behind the hills, it got incredibly cold, ok you are riding just under 8000 ft, so…. I stopped at another farm pull out & put my rain gear / wind beakers on again, then carried on to St George, I had set off from Cheyenne, at about 09 45, and got to St George at 02 30. Then I filled up, and asked for directions to the Motel, and by 03 30, I was in bed, with the big bag empty and drying clothes all around me. Total Miles 854. & 9 Fuel Stops . 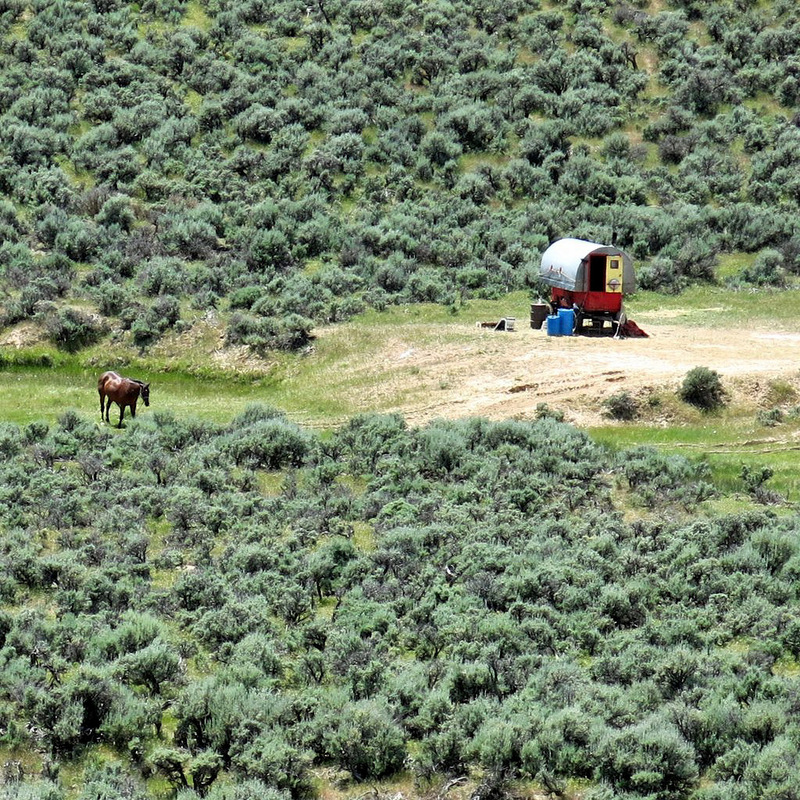 I am still pissed off, about not getting the photo of the guy,+tool carrier & wagon + horse & dog. But it was a WILD Ride !!!! Right, now I have to tell you about the Policeman in St George. I was knackered, so today, I could not tell you, if he was the Town Sheriff or a State Trooper! I remembered, from Momma’s notes, that the Chalet Motel, was on the 600 block of St George Blvd, but I had the exact address, in my notebook. Anyway, after paying for the fuel, I asked the attendant how to get to the Chalet Motel, and showed him the address. Well, that was easy, so I said thanks, and set off ! I was mid acceleration, out of the Gas Station, when I had to throttle back and throw the bike to the right… numbnuts in the Gas Station, never mentioned a solid divider. Needless to say I avoided catastrophe, and set off down the road, thinking, I cannot afford to be shunted downtown now, at about 01 30 in the morning, so I did the first left turn available to me. Ended up in a mini mall type car park, & thought, well, probably got an exit, on the other side, so I set off for that……….No, nothing, Nada. So I had to swing the bike around, and with a bit of a wobble, spotted what looked like an exit : I almost got to it, then I could see, that it was blocked off with kerb stones ; Bugger ! So, yet another wrench of the handlebars, and there to my right, was a real exit…. As he sort of stayed behind me, I thought mebbe he needs room, so I pulled all the way over to the right, and stopped. Ok, I was now thinking hmm, perhaps that right turn on red, was not valid in Utah? I took my gloves off, turned the bike off and opened my helmet visor. So, I gave him the above explanation; now remember, I was somewhat tired, ridden a long way etc.. The Policeman, listened to my explanation, and said; OK, right, well you have a nice night…..’ and started walking back to his car. Well, I missed it, on the first pass, but after turning around, the sign was more visible, and I got a room for the night. Now I really really needed a beer…..so, after doing the room stuff, I asked where I could find a beer. The Boss, pointed at a gas station next door then said have a nice night. So I went & tried to get a 6 pack of IPA…..
Jeez…… So I asked him….. well whats the time now ? ……its 03 30…… Wow, so late ? Bugger. I ended up with 2 small cartons of coconut water & a V8. Now, today I have liberated a selection of fine ales, from the State Likker Shop, and am doing my best to anaesthatize myself, so I get a full nights sleep tonight. The last 2 stops were somewhat forced, due to weather; at least now ; I feel relaxed / drunk enough, to be able to get a good nights sleep & get ready for Christine to arrive tomorrow afternoon. Weather for Utah the next 5 days, is SUN,SUN,SUN! Total ride, from Leaving P & B is 2174 Miles.